notepiler 7.0 is a remarkably unique, (dare we say it?) “fun” multimedia note-capturing tool for your iPhone. 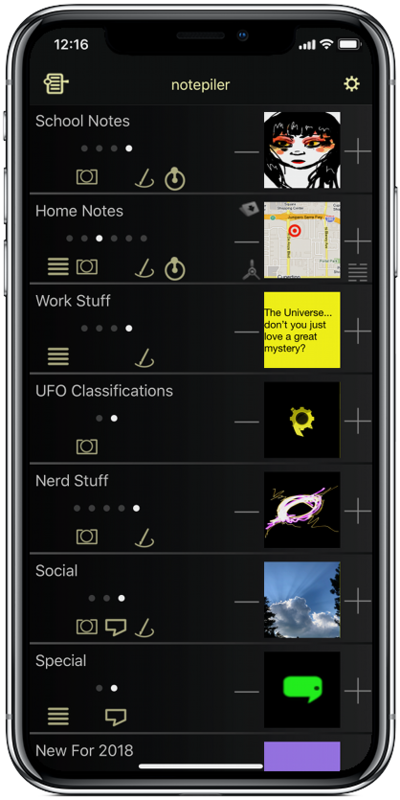 Easily create and group tidy stacks of handwritten/typed notes, sketches, audio clips, maps, and photos into concise, quickly-scannable catalogs. Adding multimedia attachments to your notes is surprisingly simple. You can even scan your notes by attachment. Add sketches. Use the standard or neon sketchers, both featuring ultra-responsive ink. Even add photos and mark them up. Color-code your notes. Embed audio clips and maps too! Easily create, edit, and move new groups with a few easy clicks. Duplicate and teleport notes within and between groups with otherworldly ease!